*This is a pretty meaty post, but lots of good information. I hope it is helpful. Health Care Reform known as the Affordable Care Act and nicknamed "Obamacare" is underway. Some changes to the way health insurance works for Americans have already been implemented, with the rest of the reforms becoming law on January 1, 2014. Just about a month and a half away. Health care is a very big deal for my family, and at least a minor deal for everyone. Also, I believe in being a good health care advocate. For these reasons, I thought I would tap into a resource I have to guide me in putting together a post that could help demystify the changes, even if only a little. You may or may not remember the anonymous guest post I published this last summer when I was away on a family trip. That post was about the costs of health insurance/health care. It was written by a friend of mine who works for a major health insurance company. She feels it best to not publicly talk about her job, so she needs to remain anonymous. I asked my friend to touch on the main bullet points of the reforms coming our way. Please understand, it is not my (or her) intention to get into a political debate over the merits, or lack thereof, of these reforms. I simply hope to shed some light on the subject, because it's happening, whether we like it or not. Here is what my friend had to say. 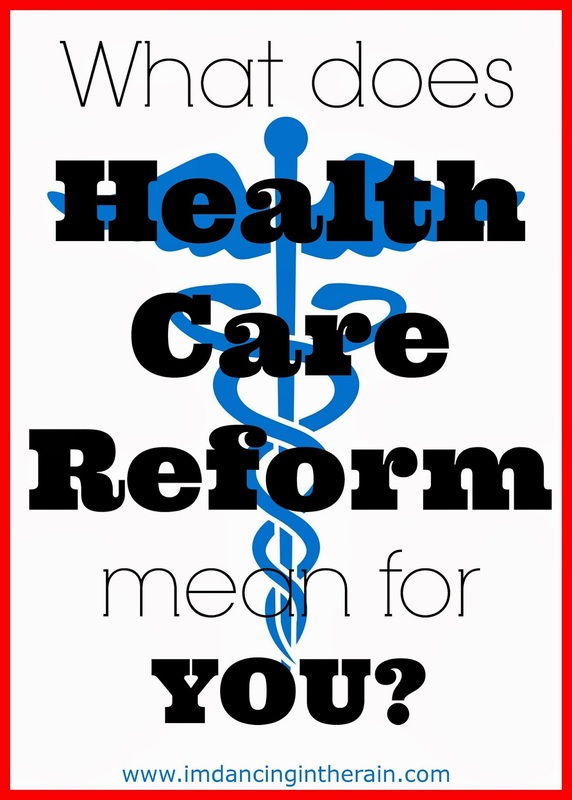 What does Health Care Reform have in store for me come 2014? There are many changes scheduled to start January first, or even prior. Everyone’s situation is a little different, so providing a general overview for the average Joe is difficult. I will touch on a few of the big topics that span demographics, however you should realize what may be available to you may differ. For examples, employers with a religious tax exemption may be exempt from offering certain services otherwise mandated by Health Care Reform. Age and gender restrictions may apply (Aspirin - men 45+ with RX from doctor). Diabetic supplies or durable medical equipment pieces may also be available for men and women within a certain age range. More diabetes specifics from WebMD. There will be a new tax assessed as of 1/1/14 as part of the Patient Protection and Affordable Care Act. Your employer may pass this tax onto you per paycheck. So in addition to paying your insurance premiums you will also be paying a tax for the privilege. Since I cover my family, mine will cost me about $26 in taxes per paycheck. That is in addition to the $130 I pay for my collective benefits which includes an allotment to my Health Care Savings Account. This tax is projected to double by 2018. Good news! Health care Reform has put a cap on how huge of a deductible the insurance company (by your employer's choice) can stick you with. The ceiling is $2,000 per individual and $4,000 per family. The bad news: this does not yet apply to large employer groups. If your employer employs more than 50 people, you will have to wait, like me. Same for total out of pocket, there is now a ceiling. Great news! Preexisting condition exclusions no longer apply! If you have been staying at your horrible job because you don’t want to start the clock ticking on a preexisting condition waiting period, never fear! Your chronic illness or condition can not be excluded from your benefit plan. Services associated with qualified Clinical Trials are mandated for coverage as of the first of the year. The actual device or drug that is being trialed is not required. But the doctors visits, labs and x-rays are what is mandated for coverage. In addition, any annual visit limitations or dollar limits on services deemed essential by the Department of Health and Human Services. Most this references the inability for an insurance company to put a lifetime maximum on your policy. It use to be they would max out your benefits at 1 million dollars, once you racked up that much in claim charges you were cut off. Well, no more! Most importantly of all you have a choice. You can now shop around on the “exchanges” for the plan that makes the most sense for you. I believe Jennifer has a great video on this to share with you. Oh, and they also extended the age limit on adult dependent children to age 26. So go ahead and let Johnny take a year to find his inner frat boy, he can add another year to his college education. 1. Are you saying some OTC meds can be paid for by your insurance? Yes, if you're within the age range and the correct gender, OTC items can be purchased at the pharmacy counter with a “prescription” from your doctor. For example if you are an old guy and your doctor says a daily aspirin regimen could help with your heart, then yes, that is covered at 100% under your insurance. 2. Do you know Why the new tax? What is it for/how is it justified? They call them “fees" and they are used to fund the changes mandated by the HCR laws. Fees will fund: Patient centered Outcomes Research Institute (PCORI) fee, Transitional Reinsurance Fee and Insurer Fee. 4. Are there any big changes we parents should know regarding pediatric care? The big news is vision and dental check ups – the routine stuff, that is now considered preventive under the essential health benefits. The hard part is how this will get administered. Most health plans use other companies for vision and dental. When the law says the health insurance must cover it the lines get a little blurred as to how to make that happen. 5. What about OB/GYN care and family planning? I think a little birdie told me that contraceptives will be 100% covered. Is that true, and is there anything else women can expect to be different? Women’s Preventive health changes applied August 2012. So most of this is already in effect. The new stuff is the OTC contraceptives. Finally, I had a few other questions regarding specifics to my family. My husband and I are both legally disabled, so we have Medicare. I looked up how the ACA will affect Medicare and Medicare Advantage Plans, and found some good info HERE. Also, I was curious as to how the mandate requiring everyone to have some form of health insurance would be enforced, and the guidelines of it. I found a good explanation of this HERE. One more thing (sorry, I know! ), this is a pretty non-biased and informative video my friend also pointed me to. I know there is absolutely more to the story, but hopefully this helps scratch the surface. 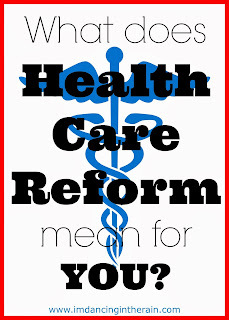 Do you know what you need to do, if anything, regarding Health Care Reform?